Faster turnaround means less time from order acceptance to delivery to the customer. We understand that customers demand products that are simple to operate, safe, affordable…and delivered faster than ever. At Safety Hoist, we are committed to making this work and have developed a plan to make it happen. 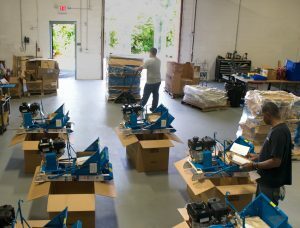 We are now able to offer one-week turnaround on new product orders and next-day turnaround on replacement part orders. We sell the highest quality ladderlifts to businesses like yours. Due to changes in our management, we are able to produce new product faster and more efficiently. We build a quality power ladder so the need for repairs decreases. If a part breaks, we provide next-day turnaround on replacement parts and your laddervator can be quickly and easily repaired in the field. Our products are designed with fewer parts so less maintenance is required. A large inventory is maintained for same-day shipping on parts for our shingle elevator. For over 45 years, our sole focus has been designing and manufacturing material, platform, and ladder hoists. As the roofing industry changes, we continue to pioneer new ladder lifts. We are committed to developing better material handling alternatives for the industry. Want simple, safe, and affordable…all delivered quickly? We deliver and pride ourselves on providing outstanding service. To order, call toll-free 1-877-99-HOIST or e-mail info@safetyhoistcompany.com for product information and pricing.